Rod and Lesley hosted a barbeque for some clergy families, from resolution churches within easy travel distance. The photograph shows the entertainer holding the children’s attention. Rod Thomas attended GAFCON 2018 in Jerusalem from 17-23 June. He joined the platform party to lead the conference in prayer at one point. He is pictured here on the screen relay from the stage. Rod is at GAFCON 2018 this week. 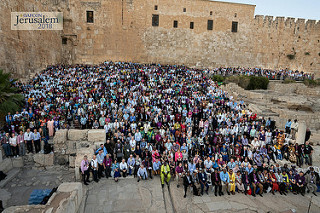 The conference has 1960 delegates – biblically orthodox Anglicans from across the world.